Will my customers be reminded of a scheduled call? Yes, your customer will be reminded via SMS. If your customer is on mobile, he/she will be reminded 5 minutes before the scheduled call via an SMS. Here's an example of the SMS sent by your customer. Can the SMS be customized? 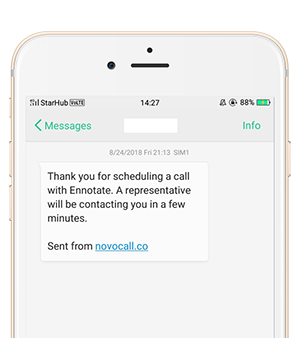 Currently, the scheduled notification SMS to your customer cannot be customized. Would you like it to be customizable? Drop us a message! Learn how to customize the SMS from successful calls and/or missed calls.